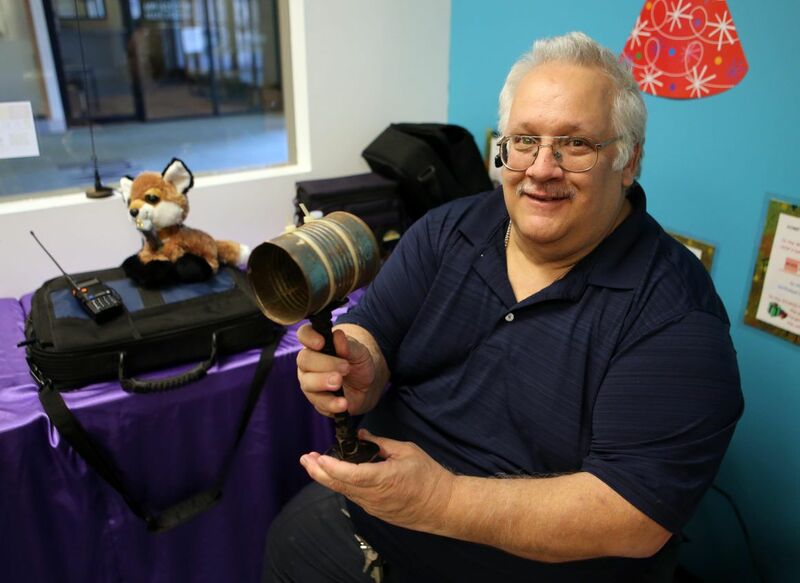 Bob Webb of Southern Counties Amateur Radio Association host a ham-radio event for the children at The Jersey Shore Children's Museum in Hamilton Mall Saturday, April 4, 2015. Bill McCord of Southern Counties Amateur Radio Association host a ham-radio event for the children at The Jersey Shore Children's Museum in Hamilton Mall Saturday, April 4, 2015. MAYS LANDING – William McCord clicked the receiver on his ham radio and sent a greeting out into the ether. This time only static replied. But sometimes he reaches people across South Jersey or even across the Atlantic Ocean. McCord, of Middle Township, and Bob Webb, of Northfield, gave a presentation on amateur radio to children Saturday at the Jersey Shore Children’s Museum in the Hamilton Mall. The Southern Counties Amateur Radio Association is a regular presenter at the nonprofit museum. In some ways, ham radio was the world’s first social network. “I’ve talked to someone in Australia,” McCord said. The typical radio signal travels just 10 miles or so but can be carried over repeaters to distant ears thousands of miles away, he said. “We have one guy in our club in England who talks to us all the time,” Webb said. Webb also introduced children to morse code, something he learned as a teenager when he got his first amateur radio license from the Federal Communications Commission. Even today operators have to take a test and abide by FCC rules such as using no foul language and staying off emergency frequencies, among others. “Texting has been around for 100 years through morse code. Even then we wouldn’t spell out whole words. It’s a binary code,” Webb said. “The idea has always been to communicate the message quickly – not to spell everything correctly,” he said. Operators typically make small talk about the weather, their location and the radio equipment they’re using. Webb said he used to talk to Russian amateur radio operators during the Cold War. They never had long conversations, he said. “The Soviets, they’d only tell you the weather and say bye-bye,” he said. Webb said he thinks the Russian operators were fearful of being monitored by their government. The club will host a field day June 27 at the Canale Training Center at 5033 English Creek Road in Egg Harbor Township. They will be competing with other radio operators around the country to set up equipment in a mock emergency, McCord said. Emergency managers in South Jersey still rely on amateur radio operators to provide backup communications after every major storm. Webb and McCord volunteered after Superstorm Sandy, Hurricane Irene and the Atlantic County derecho storm that knocked out power to parts of Atlantic County for weeks in 2012. Ham radio equipment is portable and is not dependent on cell towers or a local source of electricity. And the club gives a monthly presentation at the Children’s Museum.